Sign up with your email address to receive news and updates about up coming Sumptuous Bites events, discounts, blog posts, and more. We respect your privacy. We do not sell, trade, distribute your personal information and/or email addresses. You’d Better Recognize and Veganize! Aside from delicious poultry and seafood, as a Caribbean-American fusion caterer I also offer vegetarian and vegan items to my clients. I’ve been asked time and time again how I create “veganized” versions of traditional favorites. So, rather than tell you how I’ve decided to show you with tasty vegan recipes that all of my sumptuous scholars of the culinary arts can try at home. 2 cups cooked chickpeas (if from a can, make sure you rinse them off) If you want to go super healthy use sprouted chickpeas. 3-4 large kale leaves, chopped and steamed for 2 minutes, until tender or to liking. Steam your diced sweet potato for 15-20 minutes until soft. A great way to tell if your sweet potato is ready is by using a fork to test its tenderness. Your fork should be able to pierce the sweet potato but the potato should not be so soft that it is mushy. It should be firm but still yield to the prodding of the fork. 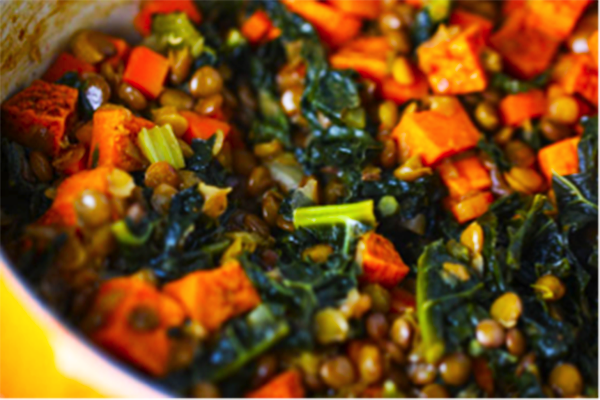 Once your sweet potato is cooked, add it to the bowl containing your buckwheat and chickpeas. Add the chopped kale to the steamer and cook for 5 minutes, or until soft. Mix all ingredients, stir well. Add some spice to your life! Stir in your jerk seasoning. Store bought jerk seasoning is sold both in dry and wet form. I prefer the wet jerk seasoning. It usually has a more intense flavor. No matter which you buy, start with less and season to taste. If your hand slips and you place a little too much jerk seasoning, don’t worry. The ranch dressing will temper the heat of the jerk seasoning and compliments the spices very well. Quickly steam your sprouted grain tortilla for approximately 2-5 minutes. Keep in mind that tortillas cook quickly and if overcooked will become extremely soft and then assume a crispier texture, similar to a tortilla chip. Be mindful of your timing. Time To Veganize Your Taste Buds! Grab a slated spoon and scoop the vegetable mixture into the warm sprouted grain tortilla. Add your mixed greens and lentil sprouts and top with a dollop of Creamy Dairy-Free, Soy-Free Ranch Dressing. Fold two corners and then neatly roll away from you keeping the contents inside until tortilla resembles a log shape. After preparing this delicious dish, the aroma alone will have you craving for a bite so, take one and enjoy! Not a fan of tortillas? Skip the wrap and toss the mixture onto a fresh bed of spring mix for a delightful salad. Did you enjoy this recipe? Contact me and tell me what type of sumptuous dishes you would like help creating. #5. Plan ahead, way ahead: Purchase your vegetables and wash, cut, and season them. Then place them in a freezer bag (remember to mark the date!). This will cut your preparation time tremendously. #4 Stick with Seafood: Seafood tends to cook quickly. Shrimp is a great addition to rice and pasta and cooks in just a few minutes. Salmon is a filling type of fish that is rich in Omega 3, which has a variety of health benefits. Prepare your fish overnight , placing it in a casserole pan so that cooking only involves pre-heating your oven and popping it in! #3 Get The Kids In On The Fun: Mom, I’m hungry! We have all heard it. Our children’s stomachs are often ready for food faster than us moms can prepare it. Want to find a great way to stall their appetites? Get the kids involved in the cooking and/or food preparation. I allow my little King to assume the role of sous chef in my kitchen and he often becomes so preoccupied with preparation that he forgets the rumbles in his toddler tummy. So get your kids in the kitchen, you’ll be thanking me later! #2 Leftover Potluck: If you have a few leftovers from previous meals, don’t toss them! Leftovers are often not enough for two but far too much for one person to eat. Serve up all of the leftovers and make play on holiday dinner. The kids will love the spread and heating it up your feast will be the lengthiest part of your meal planning. #1 Dish Up Dessert: When you are in a pinch and your meal isn’t as filling as you’d hoped, dish up some dessert! Keep a stash of fresh fruit on hand and give your little ones a fruit bowl after a meal. This will satisfy a sweet tooth while serving as a refreshing palate cleanser after a delicious dinner. Need more tips? Submit a question to our contact page and it will be featured on Nola Knows Best.